HealingHands soap cleans thoroughly with natural and organic antibacterial, antiviral, and antifungal ingredients, but unlike other soaps, it does not strip the skin of its own natural antimicrobial acid barrier so it protects skin while cleaning it. 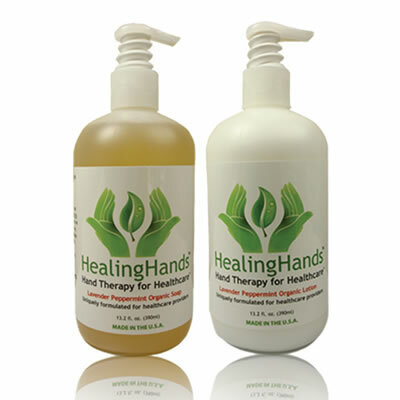 Healing- Hands lotion protects and hydrates the skin with natural and organic penetrating moisturizers, which help reestablish the skin's own antimicrobial acid barrier and provides natural antimicrobial agents that stay on through multiple hand washings. It's highly concentrated, and HealingHands products have no adverse effects on gloves.